The theatre and the amphitheatre were somewhat similar in appearance, but were two completely different entities in their use. The amphitheatre was the centre for Roman blood sports involving gladiators, animals and boxing matches. The theatre was essentially a centre of cultural and family entertainment, though both establishments were used for more general non violent pastimes. Apart from entertainment, the theatre was also used for public speaking by officials and politicians when they had something to say that was of importance to the community. They may have been announcing a new building programme, water works or giving details of laws and edicts. The theatre was laid out very much the same as the amphitheatre. In place of the amphitheatre's arena the latter was the orchestra pit. The stage was rectangular, raised, with dressing areas for the actors and workshops behind. There would be backdrops that were raised and lowered depending on the current scene. The seating was arranged in circular tiers on three sides of the stage. The theatre was intended as a universal meeting place for everyone n the town regardless of status. The town's folk build the theatre using materials and skill they supplied themselves and funding for the upkeep and events was supplied by local businessmen and the council. So in one way, the inhabitants of the town did help pay for the theatre through their taxes. Likewise acts and performance costs were met from the same source. With such a mild environment in terms of the type of show staged, the theatre was generally suitable for all the family As such the dreaded pantomime that we have to take our children to see is not new. They were around in Roman times, but not quite in the same format. Apart from pantomimes, there were plays, both humourous as well as serious and satiric. The content was controlled to a certain extent as it was not acceptable to make any play that made a mockery or was a parody of Roman government in any form. This was considered treasonable and punishable by death. The acts were varied in their content. 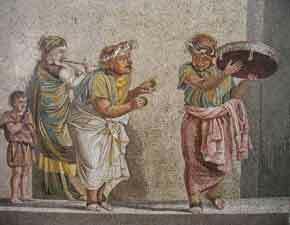 To emphasise the characters, the cast would wear costumes portraying the characters and masks to give image and mood to the individual being portrayed. It was not easy to see an actor's expression from the back of the seating, so the players would don different masks throughout the performance to show emotions such as fear, jollity, sadness etc. The vast majority of the actors belonged to travelling companies that toured Britain. They were basically a group of people who lived in caravans and took their shows around the country to main and rural theatres. Even today, a show starts with a warm up act. 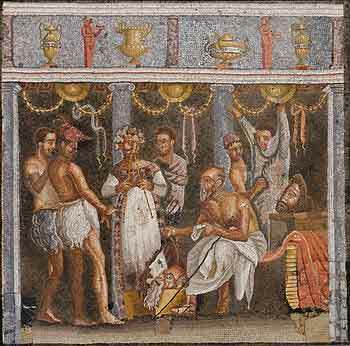 In Roman times, they knew the value of getting the audience in the relaxed frame of mind. An actor would come onto the stage and do a comical routine using interaction with the audience and topical issues of the day. Then next part would probably be a pantomime. These were more serious than we know them today, and many took stories from mythology as their theme. Even so, they contained music and dance to liven up the story. The story telling of the period was a bit basic with many plays not having a definite conclusion. If the characters were in a hopeless situation at the end of the play, then an angel or a god would appear and wave a wand that solved all their problems. For some dramatic tension, the author would sometimes make the act of waving the wand kill all the characters in the play. This sort of ending was known in Latin as Deus ex Machina, or 'God from the machine'. Next may be a mime act where masks were used to portray emotions to emphasise the actions of the mime artists. This would be in a lighter vein to bring the audience back from the, often serious, theme of the pantomime. Then would come the main play. This could be anything from a comedy to a thought provoking look at life. Most plays were taken from history. 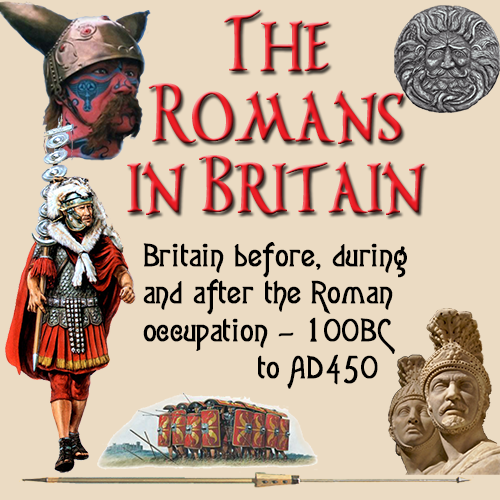 As the Roman Empire grew, so subjects and stories used in these plays became more versatile. When it was all over, the whole cast would appear on stage and take their bow. If the show had been a good one, there would be cheering and clapping from the audience. This was generally the case, as the shows were free anyway.